The existing conditions at the Longfellow Towers apartment complex in Boston’s West End neighborhood expressed failing site and structure conditions, including water leaking and penetration to parking and office structures below the on-structure deck and mezzanine. The pre-existing auto court and colonnade presented a cold, poorly illuminated, and generally inhospitable environment for pedestrians and visitors alike. The mezzanine level pool deck, which provided bathing and gathering for residents of the West End housing system, also expressed a vast, barren, and stark open space. Support structures including an odd pool storage house along with an insecure open stairway to the lower level maintenance also posed a safety concern and were an eyesore to the residents of the space. Large, overbearing yet necessary vent shaft structures also inhabited the space. 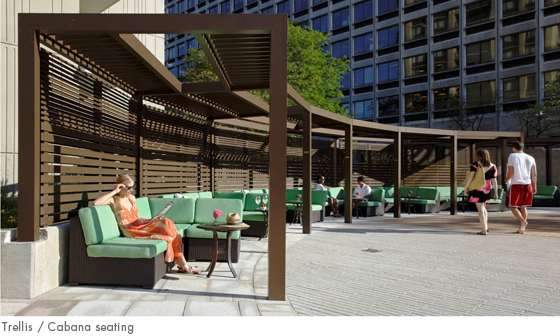 In all, the client’s desire to reposition the property in order to stay competitive with the current and emerging housing market in downtown Boston served as the catalyst for this redevelopment. 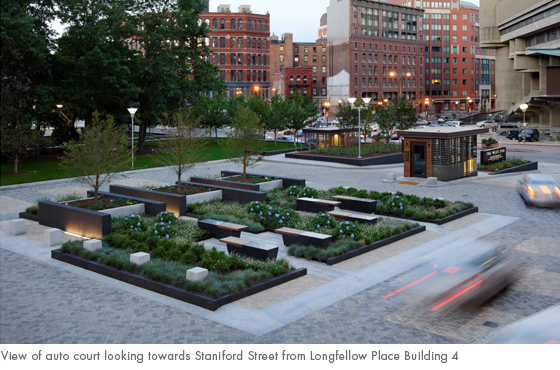 The design approach for the Longfellow Towers Improvement project sought to provide warmth, clarity, proportion and continuity to a seemingly forgotten and underutilized space. 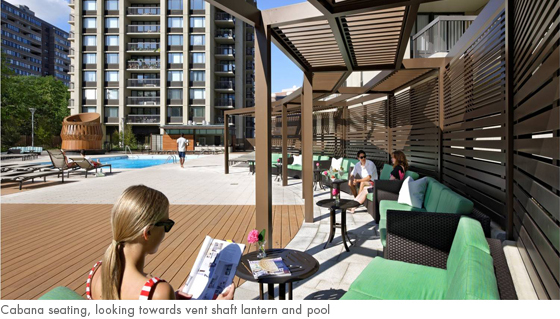 The existing residential towers, with their striking shadow-play created by the strong fenestrations in the concrete, served to inform the design and proportions of the new spaces and the elements within those spaces. Understanding the movement through and views of the space, CRJA chose to use warm materials such as tan and brown stones and colored concretes throughout the design to offset the once cold nature of the environment. 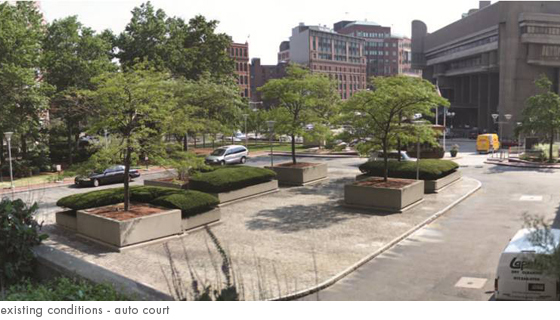 The auto court, with its asphalt pavement and tall curbs, and which was once dominated by cars, has been returned to the pedestrian – shifting the access and comfort of the space to its primary user. 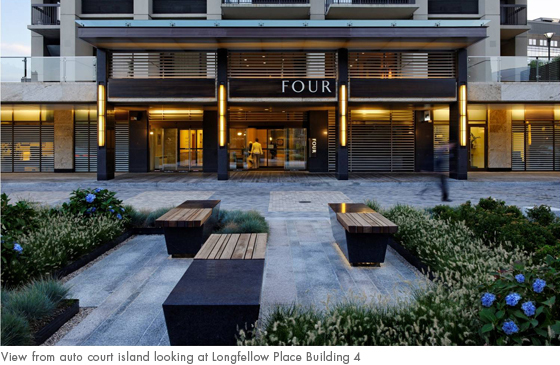 A hard, cold center island was transformed into a planted centerpiece and textural forecourt for the urban residences, featuring custom designed granite and teak seating elements. An underlying function of “3” provides a simple rhythm within the space as well as a graphic tie to the “W” and “E” associated with the West End. The unit stone color aids in identifying movement zones from drop-off areas, with the colors associated with drop-off zones blending into the colonnade. Cutting back the pre-existing overhang of the mezzanine level allowed for increased light to make its way into the covered walkway zone. 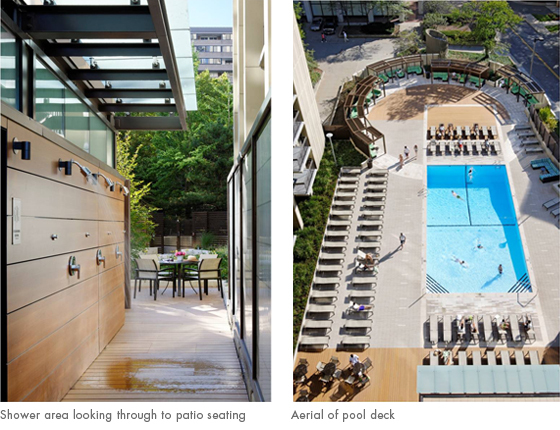 The design philosophy of warmth, clarity and proportion continues in the pool deck, grounding the space on the rectangular pool form and extruding a “bar” in plan on the space. 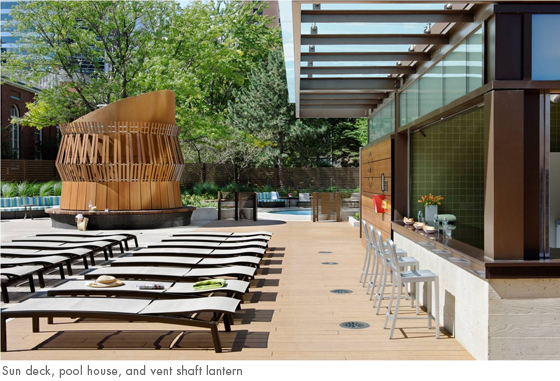 A shifting circular cabana seating zone anchors one end of this “bar”, while a new pool house finds a prominent and clear home at the other end. The surface shifts between concrete unit paver, Trex decking, and granite, with a custom reflecting paving pattern of unit stone occurring within the bar adjacent to the pool. The pre-existing concrete vent shaft was repositioned into a “lantern” art piece with a custom, backlit, Trespa lattice screen wrapping the circular form, which was designed by CRJA. Surrounding the pool area are a custom aluminum fence and concrete wall which also draw inspiration from the linear shifting shadow-play of the tower elevation. To create a truly integrated design, CRJA worked collaboratively with Elkus Manfredi Architects to develop a strong relationship between architecture and landscape. Often, design creativity is tempered or hindered by a site’s context or construction limitations. 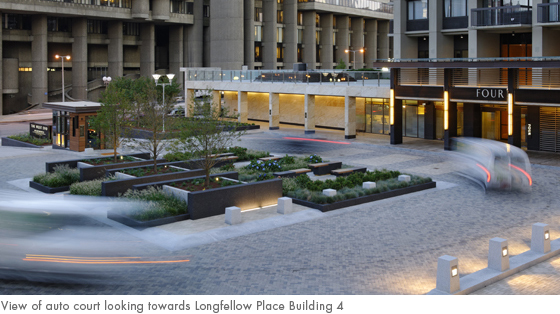 The Longfellow Place Improvement Project chose to draw from what many consider a “Brutalist” architectural expression the essence and unique moments of shadow and repetition in the site design and detailing. Working within the very strict, tight spatial and weight limitations of the on-deck condition, the design team finely detailed and executed a rich and complementary pallet of materials. 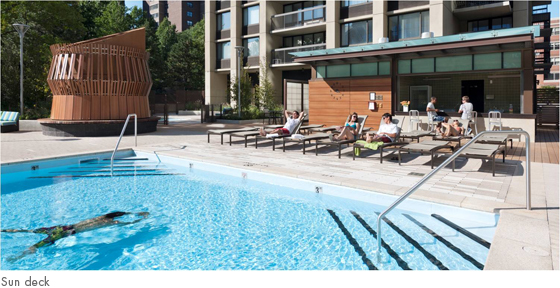 By employing lightweight structural fills, CRJA achieved the desired pavements and surfaces within the pool deck area. Reuse and repositioning of existing site elements which many would have chosen to demolish or ignore, such as the Vent Shaft Lantern, and turning them into fitting focal elements within the space further helped to express a truly creative landscape design approach. 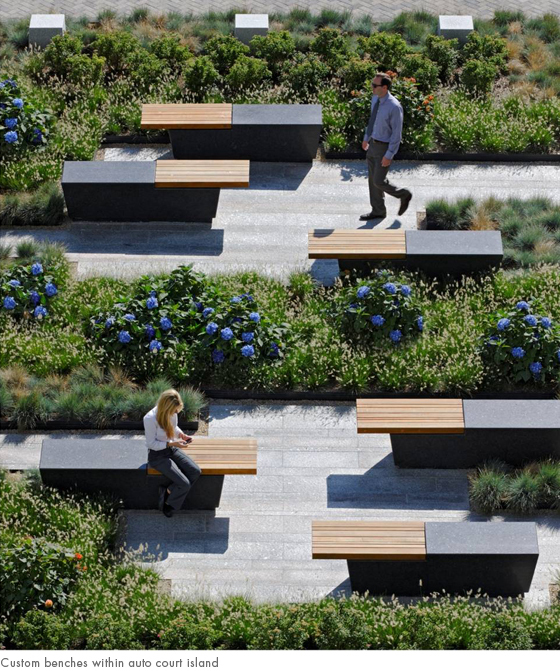 The transformation succeeds in creating a true urban oasis for the users of the space, providing unique and identifiable pedestrian level spaces as well as graphically contextual overhead views of the property for all of the inhabitants of the towers and adjacent structures.